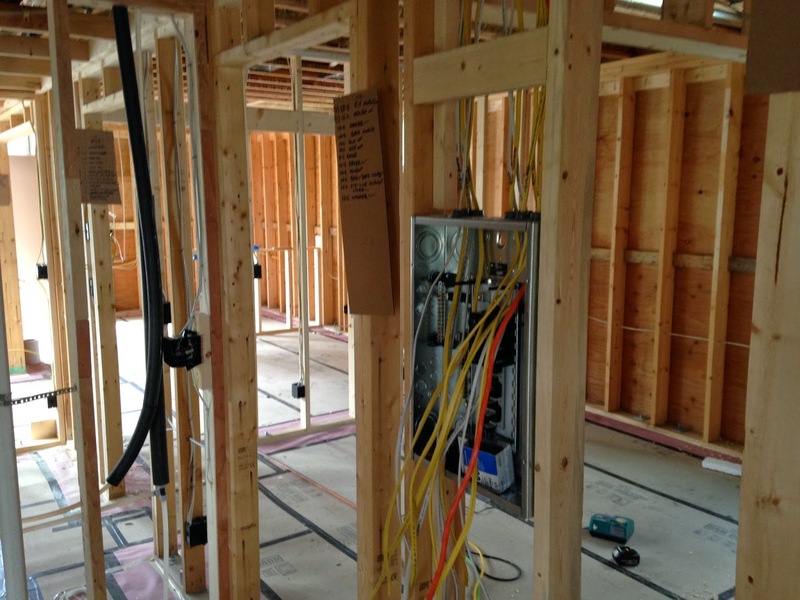 One of the design challenges of a house, is creating an electrical layout. Some things are obvious, like outlets for appliances and general outlets throughout. Switch locations also are typically easy. You place them in locations that you enter a room. One of the things that is not so obvious is how best to light the space. 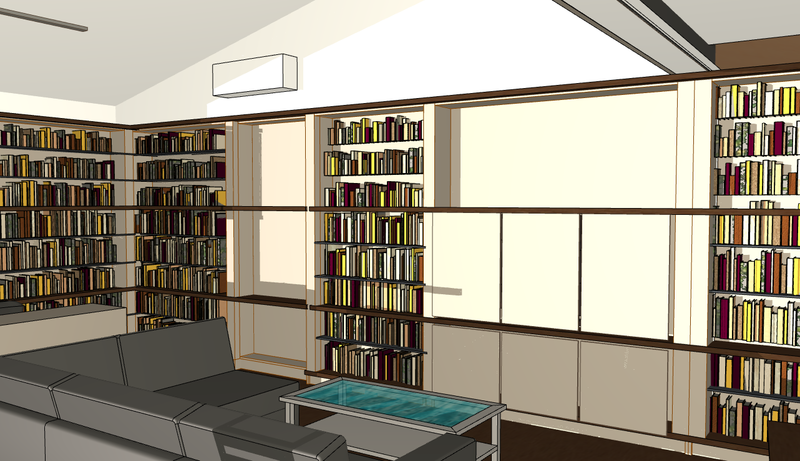 I designed all the spaces to maximize natural daylight and while there are places for special pendant lights, I wanted most of the lighting to not be so obvious. 1. The majority of fixtures to utilize LED bulbs if not specifically LED fixtures. 2. Minimize cans. 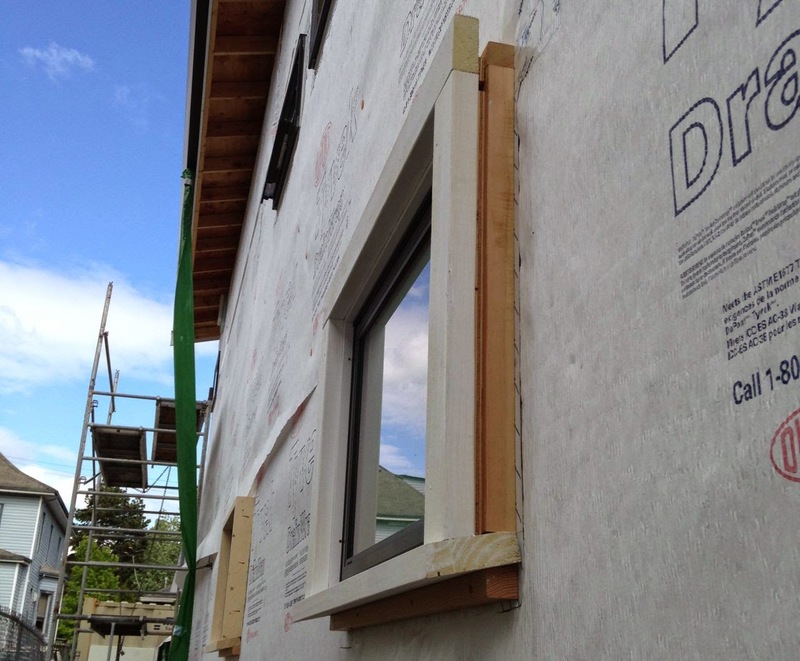 We are paying extra special attention to our air sealing. After doing extensive research online, we decided to forgo the use of cans in our ceilings where there is also insulation. This means most of our upstairs. 3. Low cost. It is very very easy to spend lots of money on electrical fixtures. Not so easy to find aesthetically pleasing inexpensive fixtures. I will do more posts on this later. 4. Providing enough light, but not over doing it. In our current home, which is very similar space to our new main room space, we over did the lighting. There are 4 cans in the kitchen we never use and a track light at the ceiling we never use and 2 cans over our sofa, that Neil dislikes when I use to read...so I now have a reading lamp. 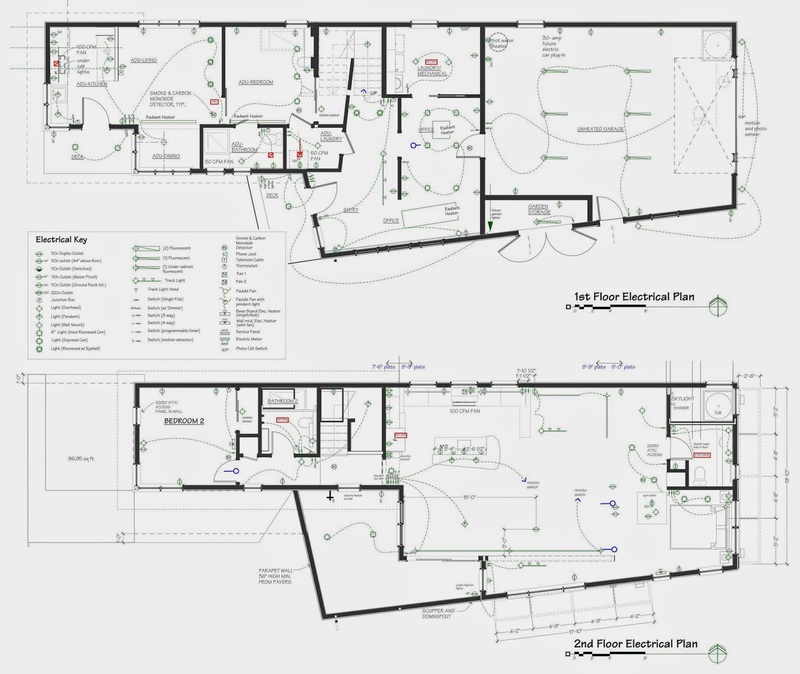 Even after creating this lighting plan, it is important to do multiple walk throughs with the electrical contractor. We made a few changes to lamp locations after seeing either conflicting framing or just rethinking what we want while in the space. Ideally all the fixtures are chosen ahead of time so they can be placed in right spot, but the reality is, I know generally what the fixtures will be (sconce, pendant, light strip, track) just haven't selected and bought them yet. The electrician has started. Above is the view in the living room of the apartment looking towards the front door and kitchen. A protective board now covers the concrete floor. 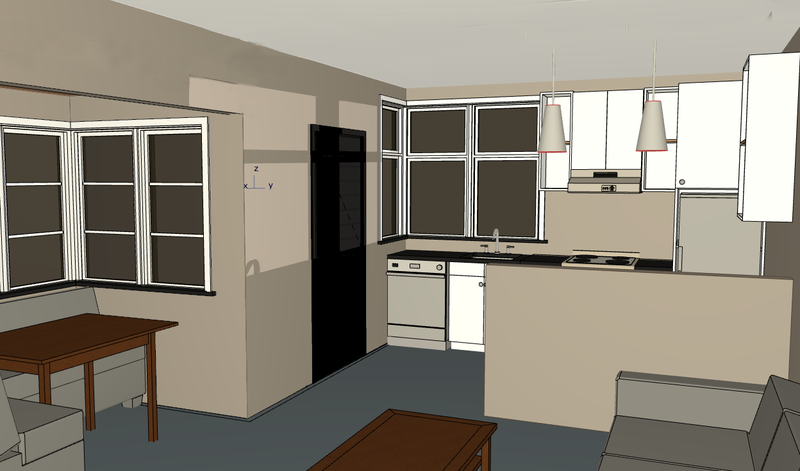 The renderings are very basic...we have not chosen cabinet material or colors yet nor light fixtures, but I wanted to show a bit of the process. It is extremely helpful to have the 3D model to continuously go back to. 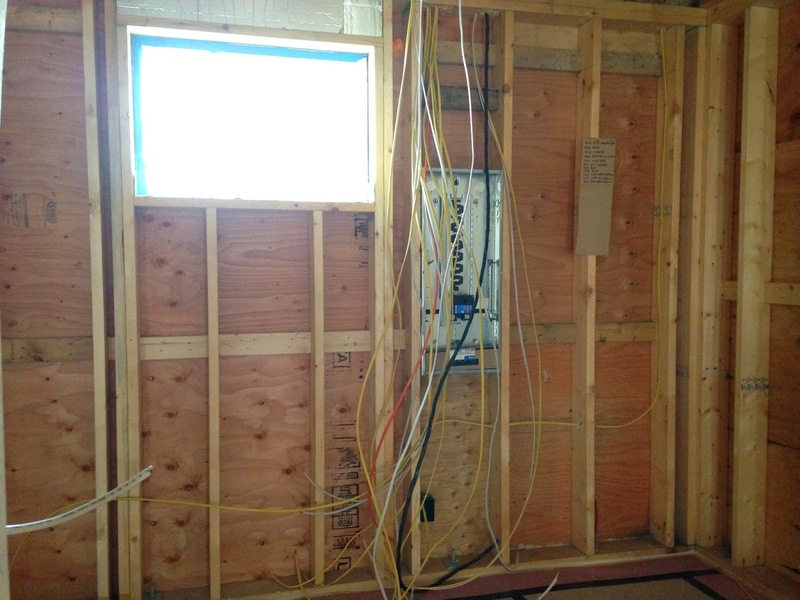 The apartment will have it's own subpanel which is located in it's laundry room. Ours is also located in our laundry room below. I love Neil's cardboard lists that are tacked up in different rooms. Here they list what wires have been run and below is a to do list. 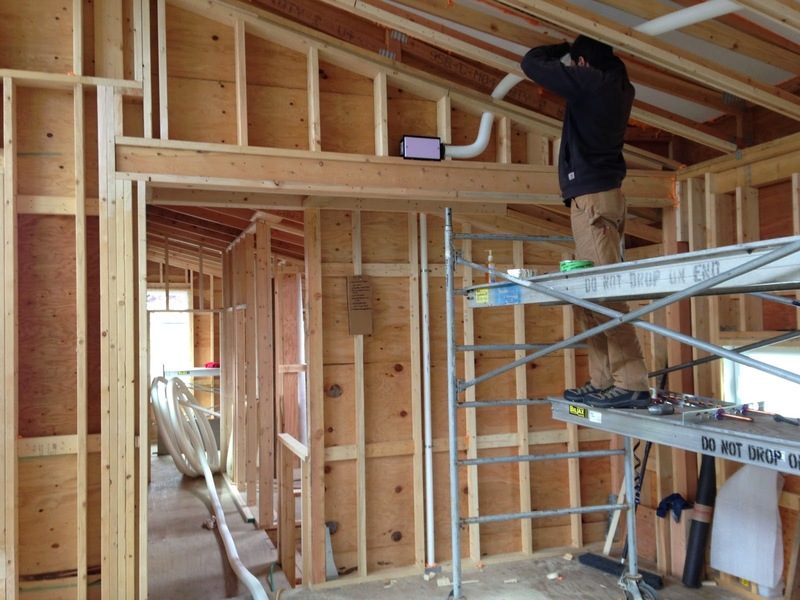 The picture below shows our bedroom to the right and the enclosed space to the left is our bathroom with the conditioned attic above. 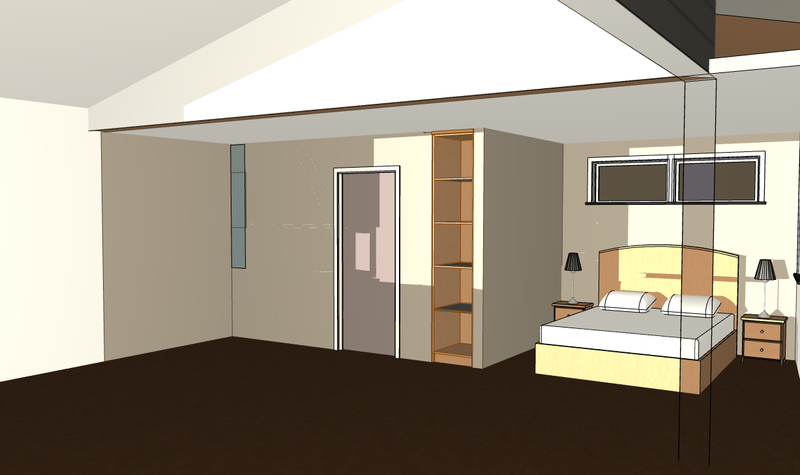 One of our challenges is that I did not want actual walls between the living room and bedroom/ closet area. 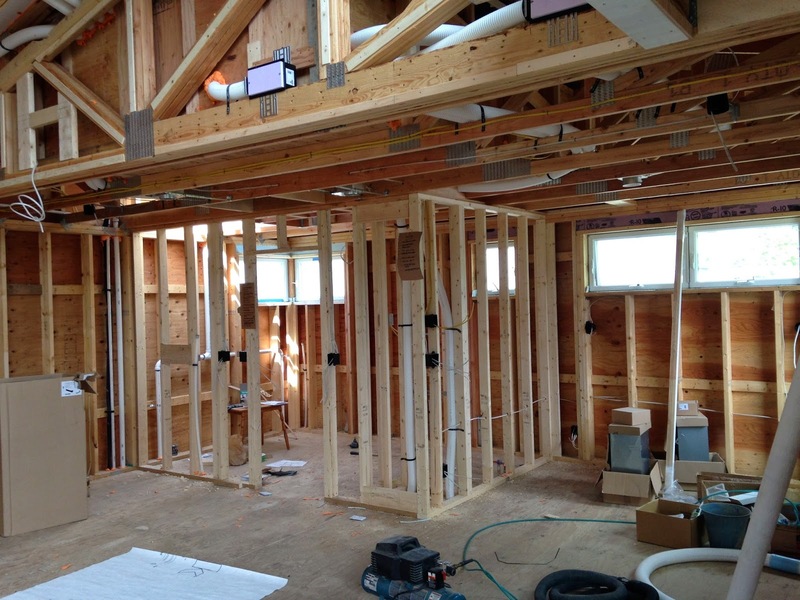 These will be walls of bookcases, which makes installing electrical outlets and switches more difficult. The outlets will eventually be in the bookcases and we are doing remote control switches for the living room. While the subcontractors are inside, Neil has moved to the outside. He will be adding 1-1/2" of rigid insulation on the exterior of the building...over top of our weather barrier which covers our 1/2" plywood sheathing. 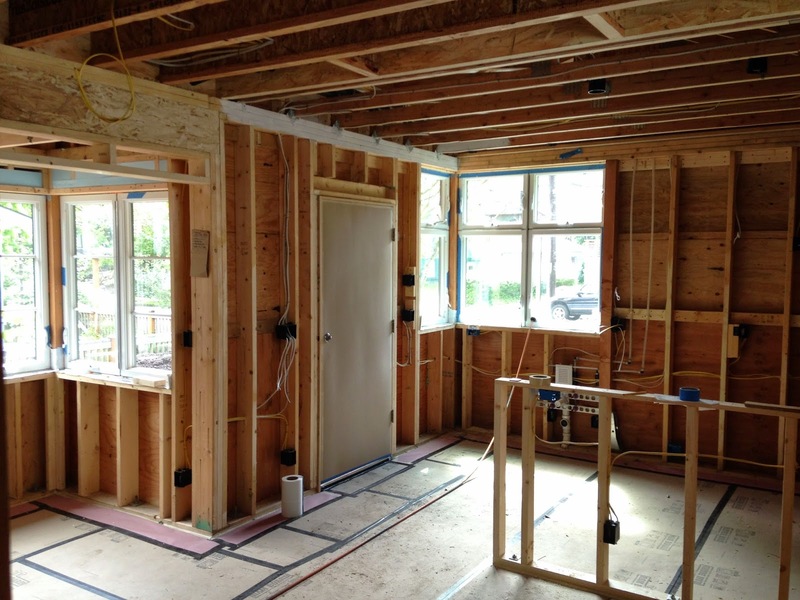 Once the insulation is applied, he will then install 3/4" plywood battens vertically, aligned with the studs in the wall. This will create a drainage plane behind the siding. 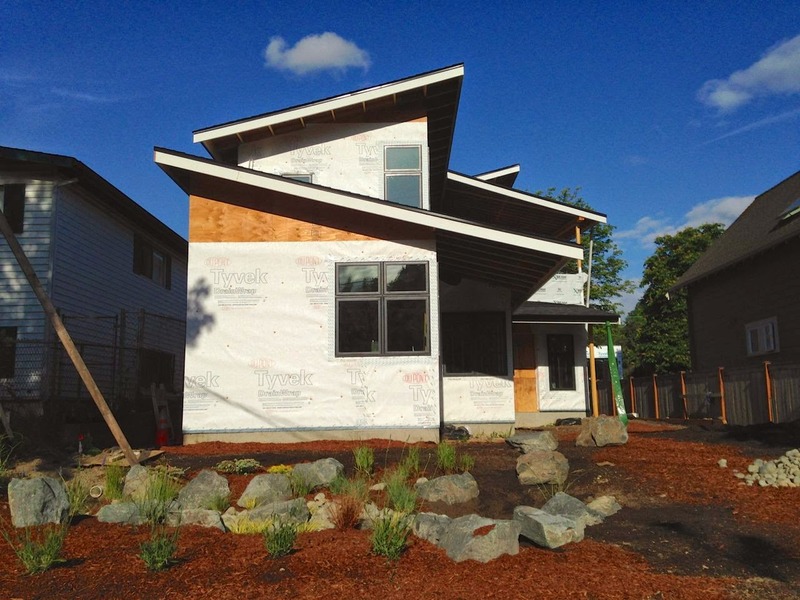 We are using 2 different types of siding. 1x6 cedar beveled siding that we are having pre-stained black and 8" exposure James hardi lap siding which will be painted an undecided grey. 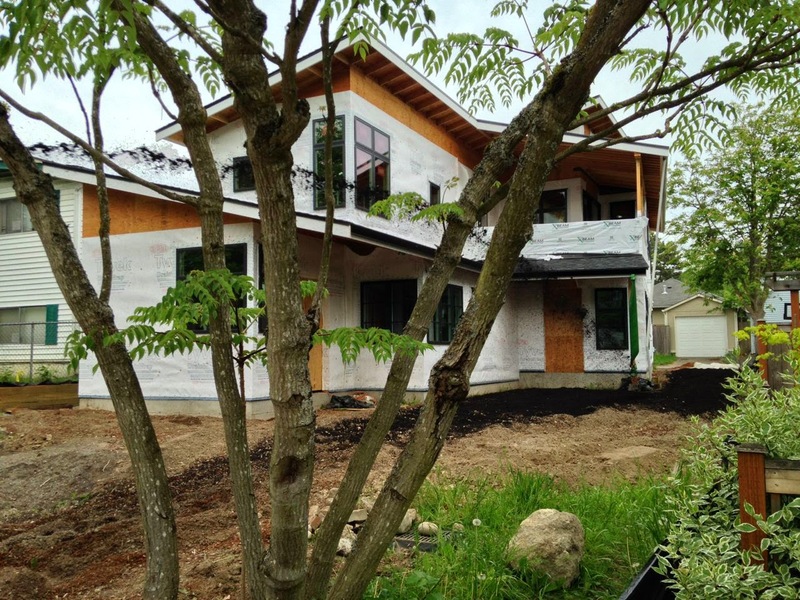 Because we are adding more thickness to the wall, we had to rethink our exterior trim. 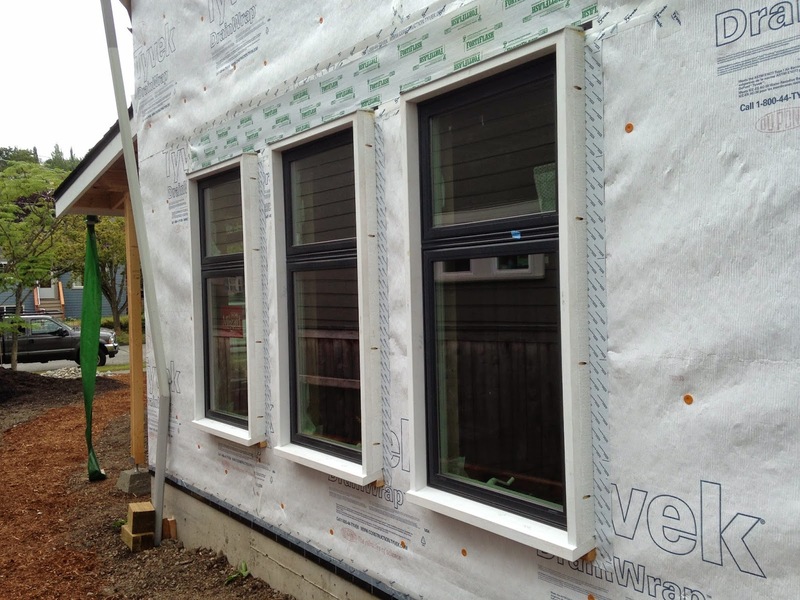 Originally we were wanting a 3-1/2" wide trim that would be picture framed around the window, but after mocking it, we came to re-evaluate this due to the multiple 12 steps to building it out versus 5 for the 2x on end. 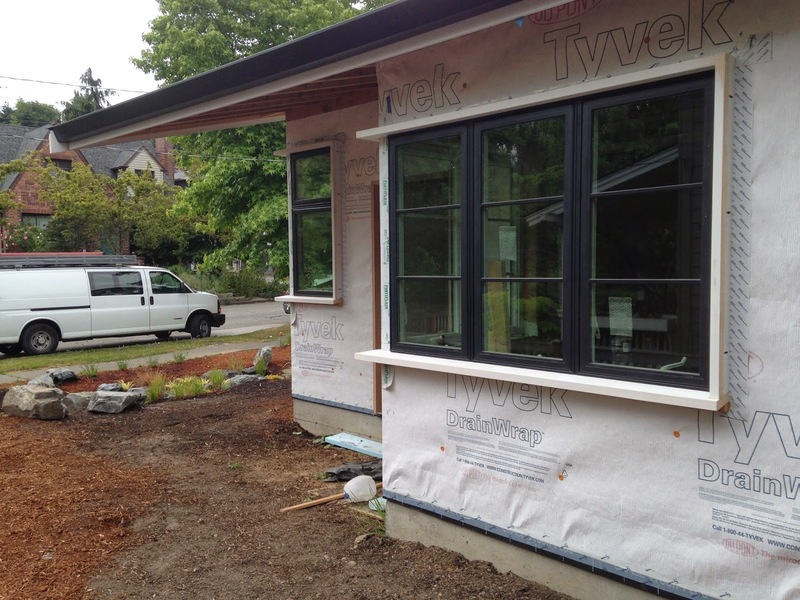 12 x 34 window groupings equal a painfully slow process. So we decided we liked the more streamlined look. You can see all the extra blocking needed in this side shot. We also briefly looked at adding a stepped trim piece around the frame, but decided against it's fussiness. We have tried to minimize the fan vent locations and while we do not have individual exhaust fans for our main part of the house, we still have them for the apartment portion. For every hole coming through from the inside to the outside, Neil has boxed it out and flashed it like below. 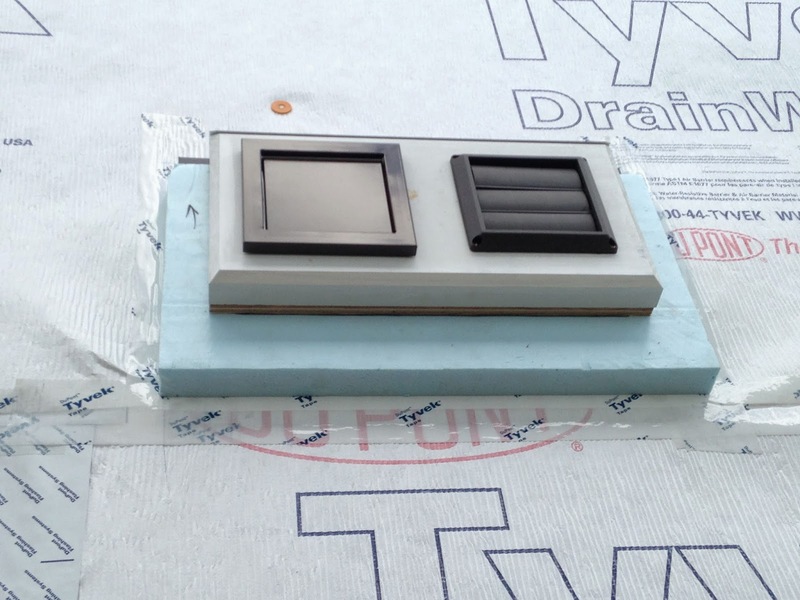 All of the vents, hosebibs and exterior electrical outlets receive this treatment. 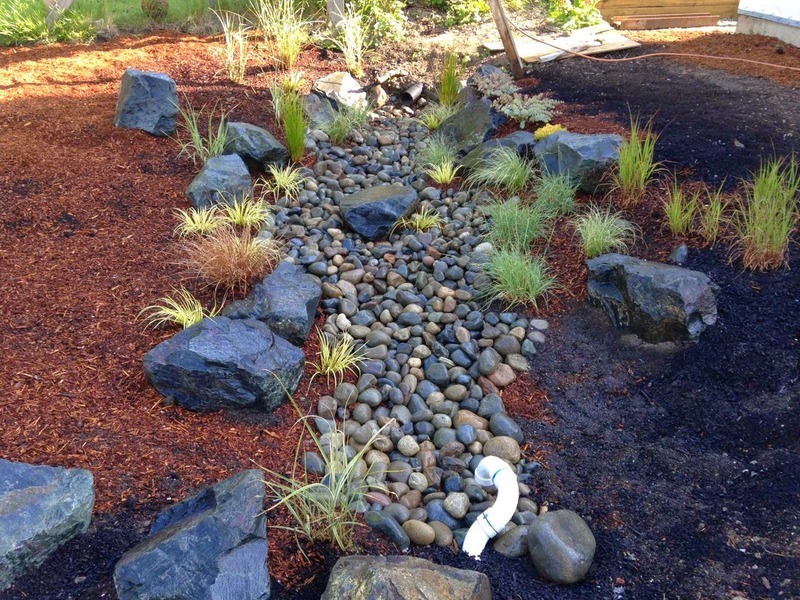 First section in the yard was our rain garden. 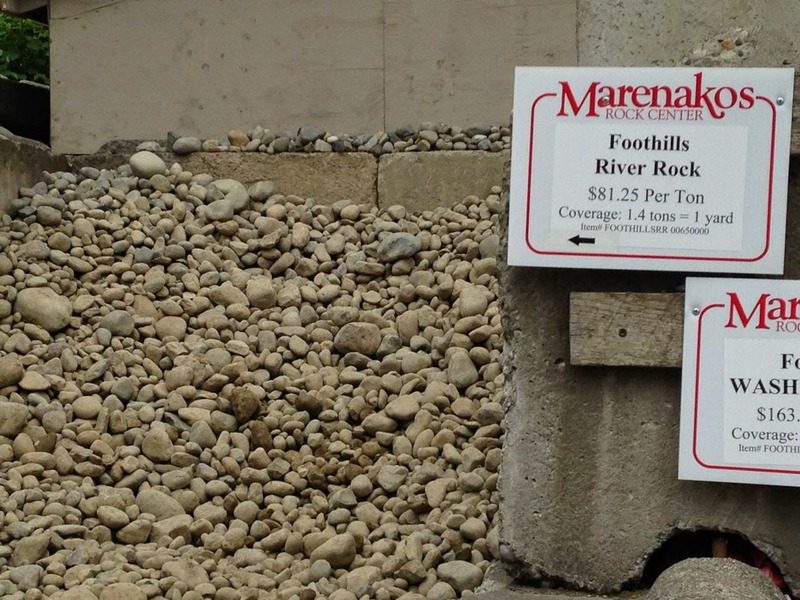 One of our city requirements was to collect a portion of our impervious surface rain runoff in one of a couple ways. 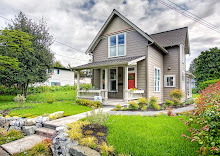 We choose to create a rain garden in our front yard. 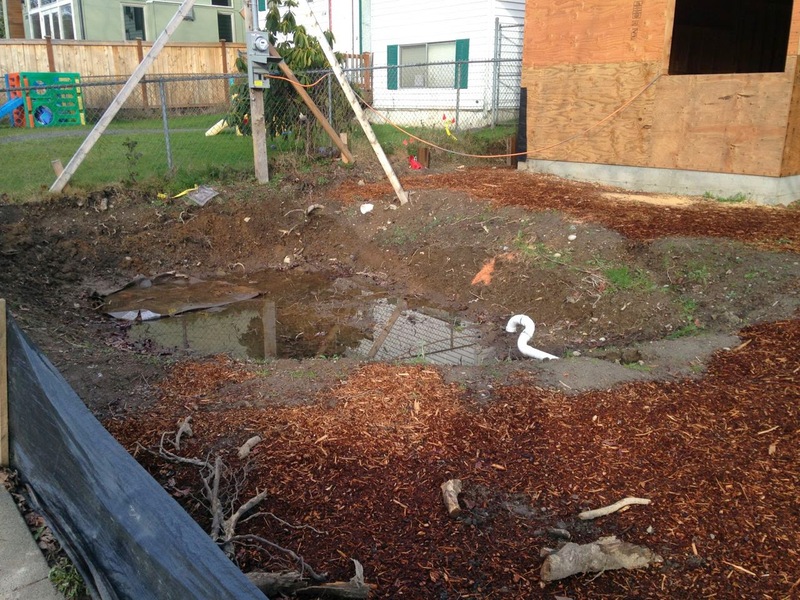 The first step was to dig down about 18" to the native clay soil. Then we brought in 10 yards of special bio-retention soil to fill the hole. I took a few days off of work to be able to focus on these next steps. 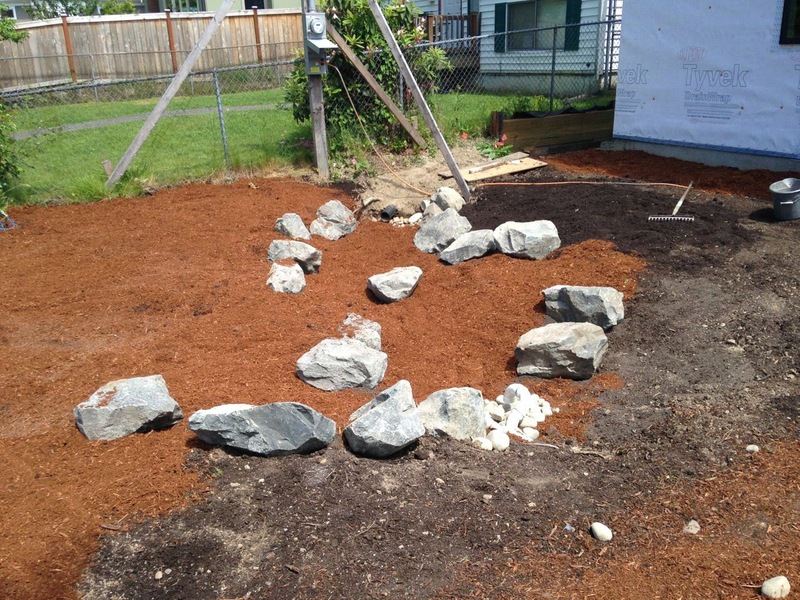 After moving the rocks into place, we spread a layer of mulch down. It will take a few years for the plants to fill in. Meanwhile, I wanted to cut down on weeds. The idea was to put down the mulch first, then just move it aside when I go to plant. Next up the river rock. 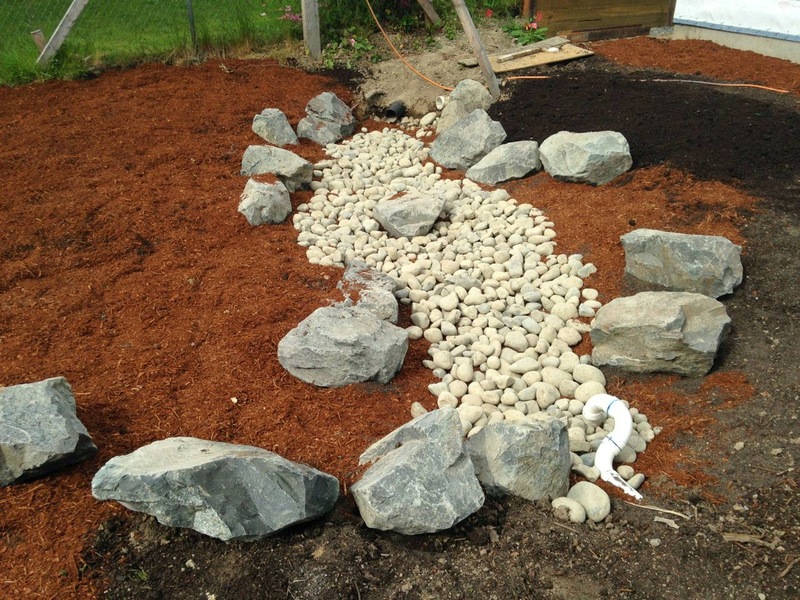 I wanted to create the look of a stream bed. 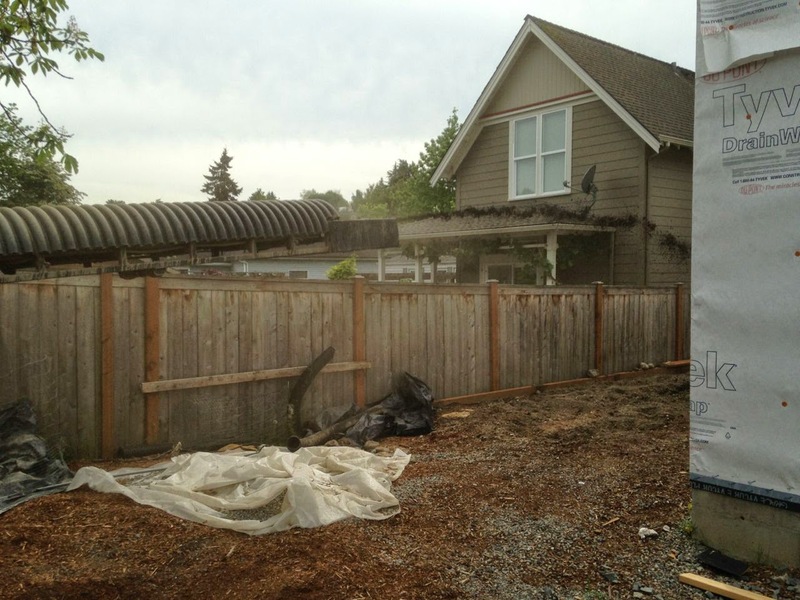 The roof water enters at the top of these photos and is absorbed into the soil. It's designed to have 2-4" of standing water and in the event of a major storm. If the water rises higher, then it will drain into the white pipe at the bottom of the picture which then drains into the street...which then drains into the city storm water. I also put some lavender in and sedums up in the dryer part. After getting this in, I have stopped planting now till the fall. We are about to go into our driest months and while I don't mind watering some, I also don't want to lose any plants. 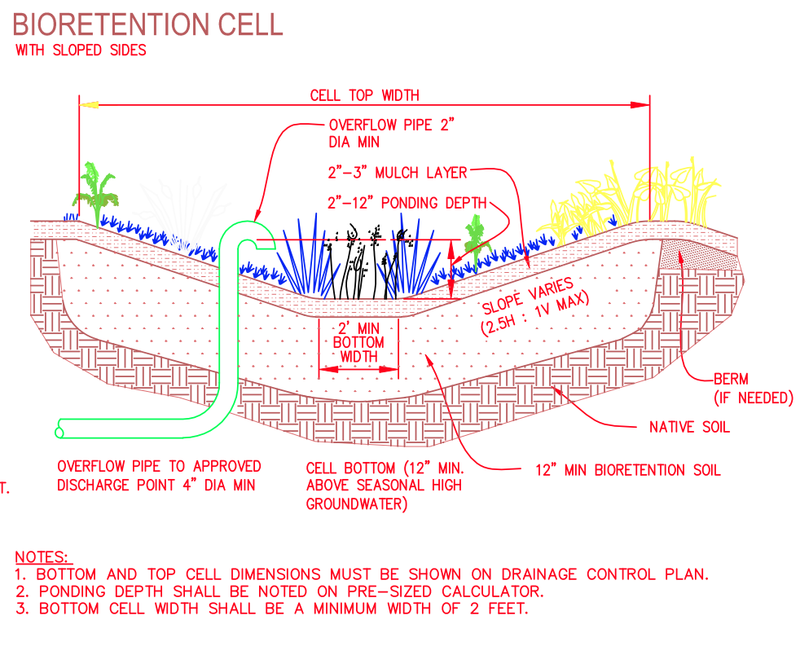 The below diagram is from the City of Seattle's drainage requirement that you can download here. 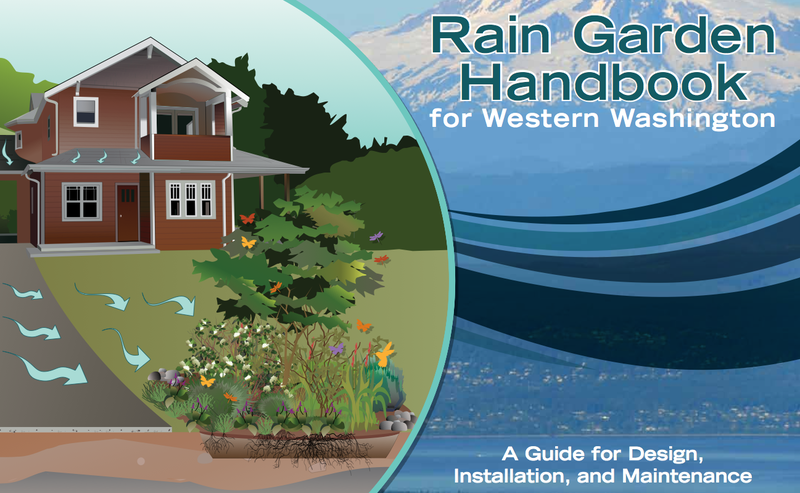 My main resource for creating this was the Rain Garden Handbook for Western Washingon that can be downloaded by clicking on the image below. Like many people, I'm drawn to gardens for their calm serenity and their beauty. I love texture and color and 1/3 of the photos I take are landscapes and gardens. 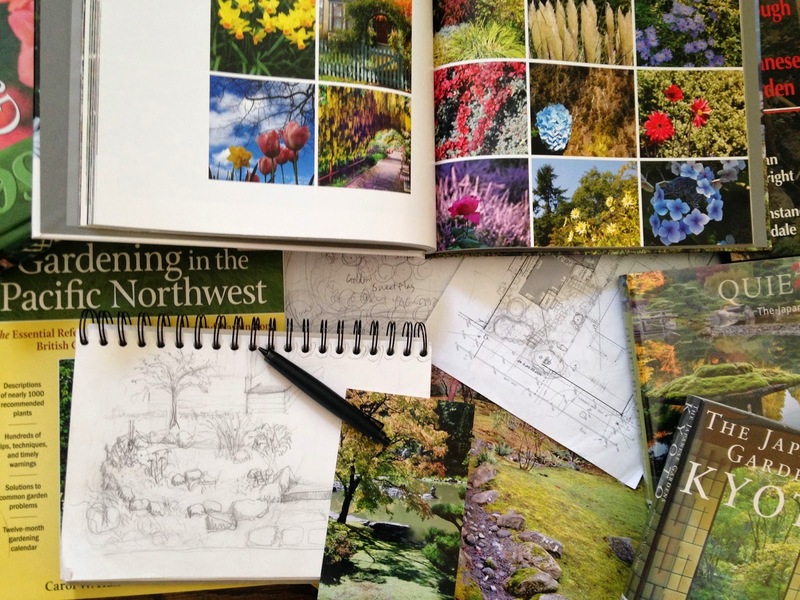 In preparation to designing our garden, I pulled together a bunch of my photos and created an inspiration book. 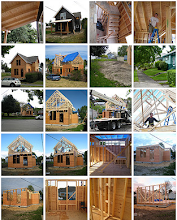 The individual photos can be found on my flickr site. 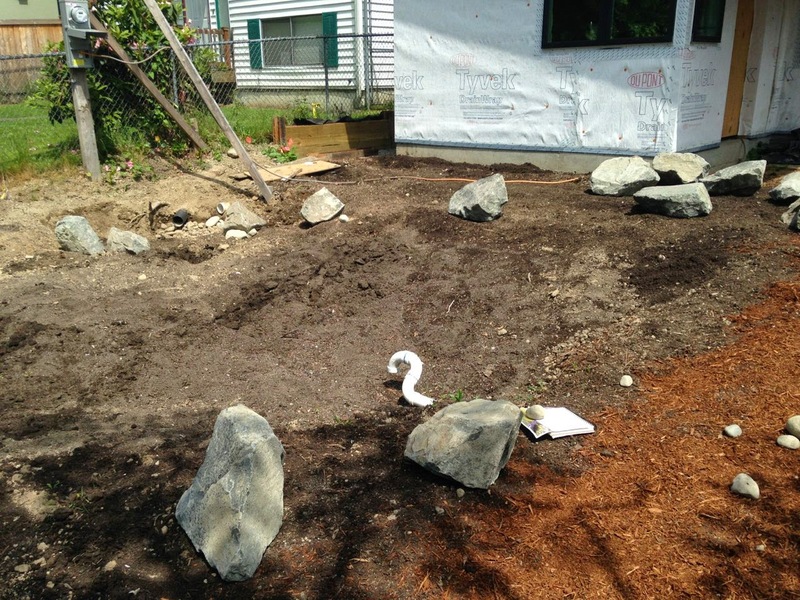 I had originally planned to hire someone to help me with the install of the garden. I had a rough idea of what form the garden would take, but not the specific plants. But then I realized that the garden is something that will be constantly evolving over our lifetime of living there, so it doesn't have to be perfectly done right away. Therefore, I can do a little bit here and a little bit there and learn more about gardening as I go. So I've been reading a lot of books and studying my photos more closely and making lists of the plants I want to include. I've also been visiting our local Japanese Garden at different times of the year. We are lucky here in Seattle to have so much greenery all year round. 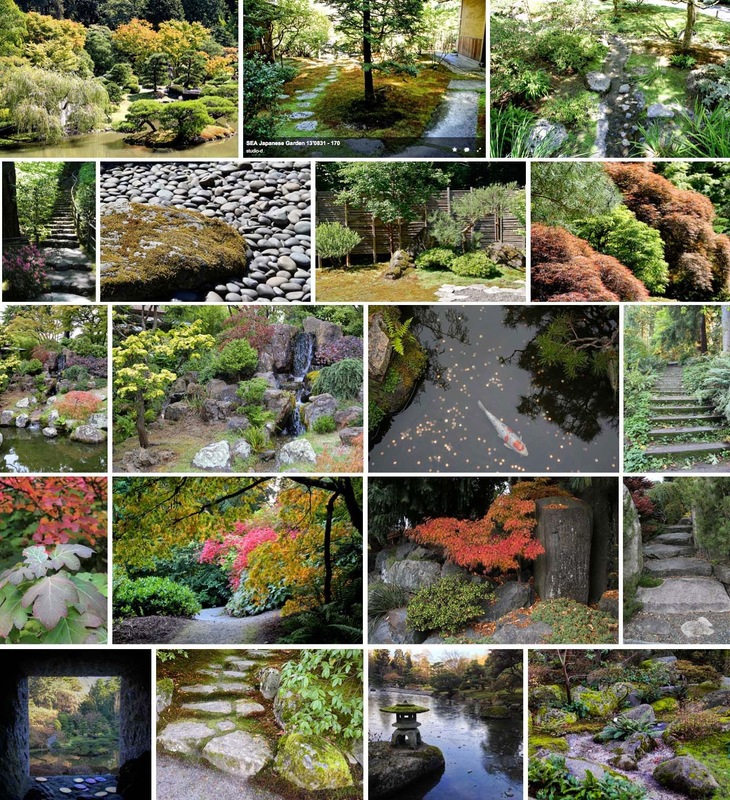 The Seattle Japanese Garden and the 230 acre Washington Park Arboretum are just a 5-10 minute walk from our property. As Neil works on the house, I've been working on the yard. 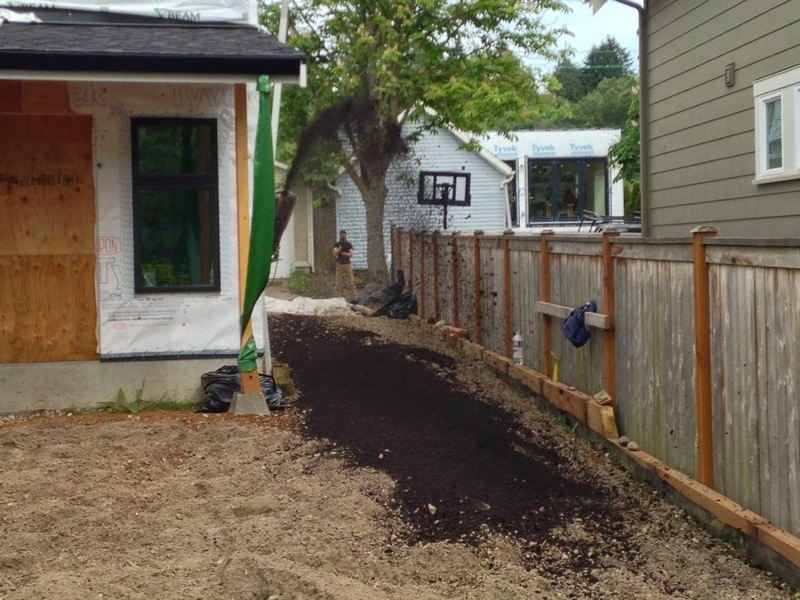 In May we brought in 15 yards of compost to amend our clay soil. That's the lovely dark brown above, on top of the not so lovely clay. First we tilled the clay soil. Next we brought in the compost and spread it from the conveyor on the truck. Much easier to do that than spreading it by shovel and wheel barrel. 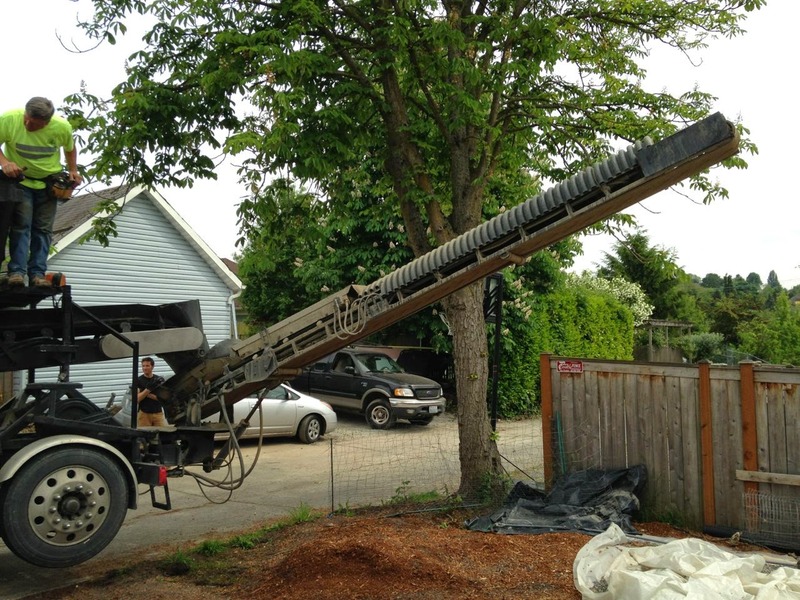 It cost us an extra $300 to have this company pick up the compost and spread it. Totally worth it. Then we tilled the soil again to mix it all together. After all that, I brought in a couple loads of medium mulch to cover the soil. I will be doing my main planting in the fall, but want to stop the weeds from overtaking. Every place I had not put the mulch down over the winter, I had to pull out 1'-2' grass/weeds. So this time it will all be covered. 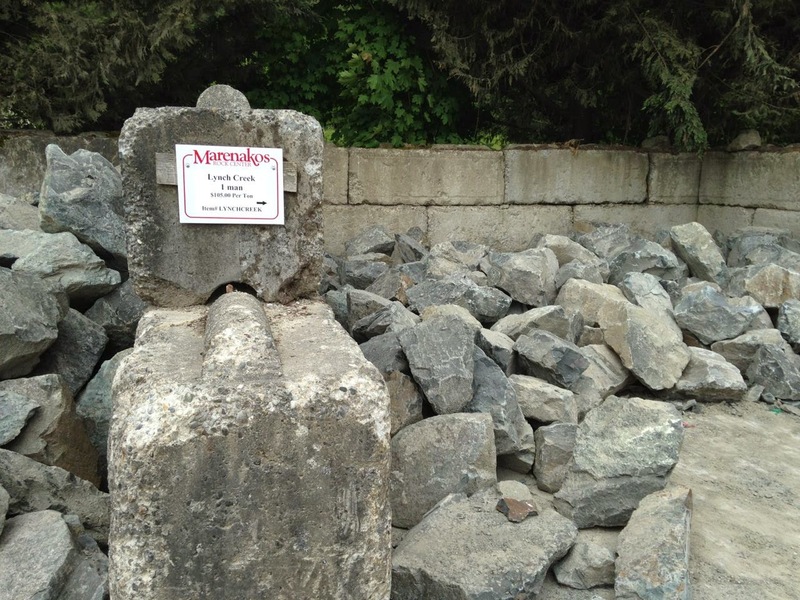 In preparation for our rain garden, we went rock shopping at Marenakos. I had done a trip back in February to scope it out. It's an amazing place. 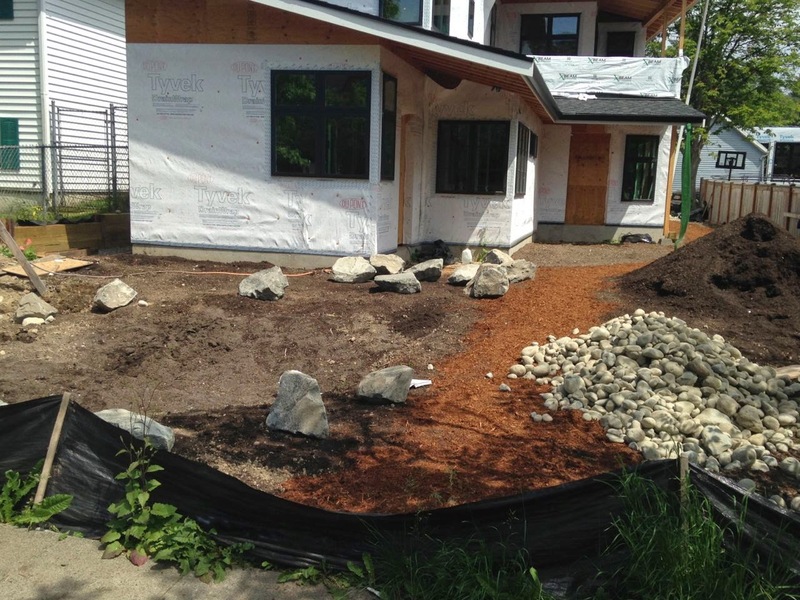 All kinds of rocks and hardscapes. We rented a truck that could carry and dump the load. 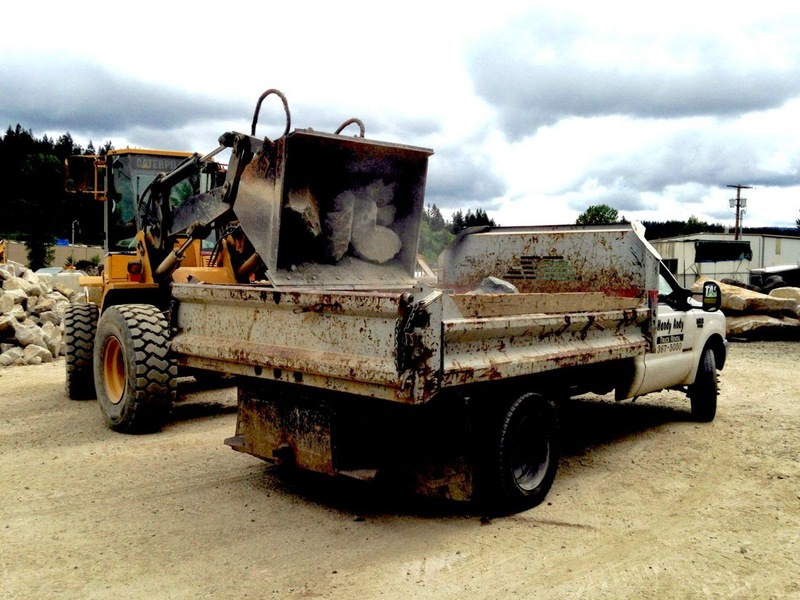 This is about 6.5 tons of rock. 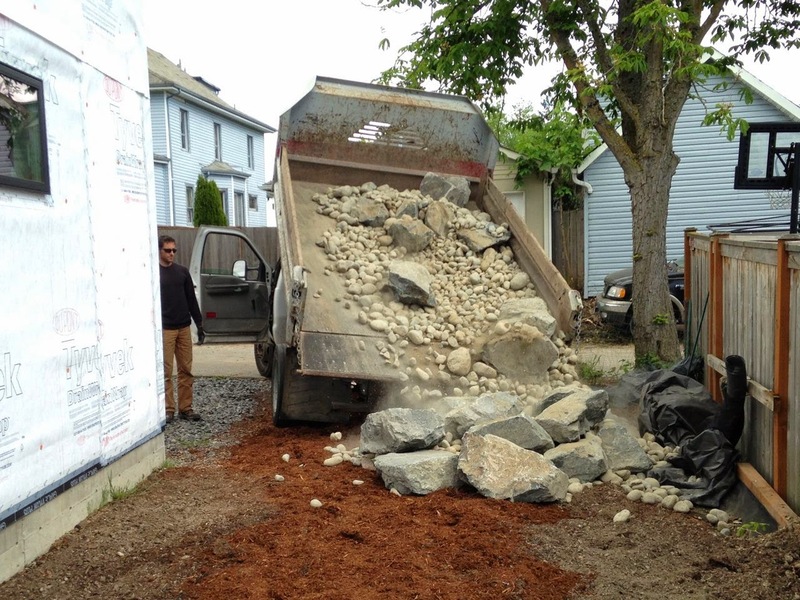 3.5 tons of 1 man boulders and 3 tons of river rock. 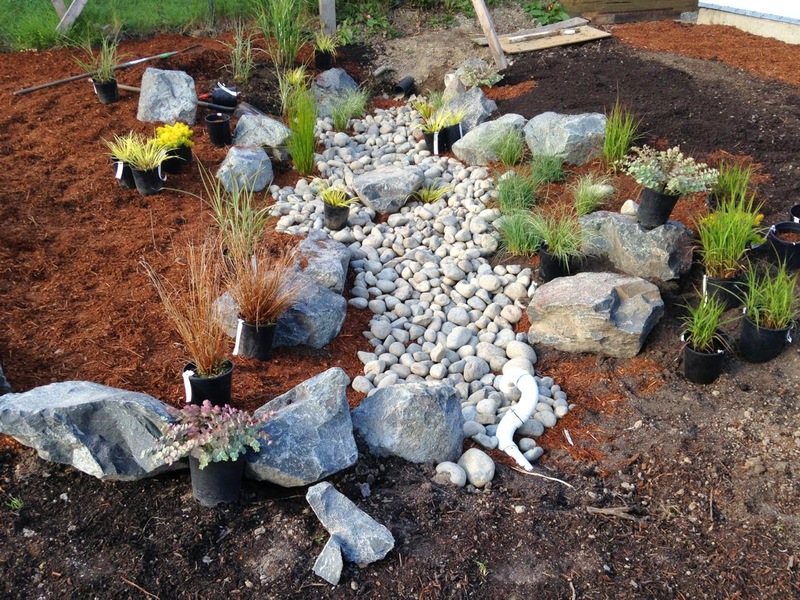 Next posts will be about the rain garden. We have been making steady progress and I need to catch up a bit on the blog, so I'm going to do a few posts this week. 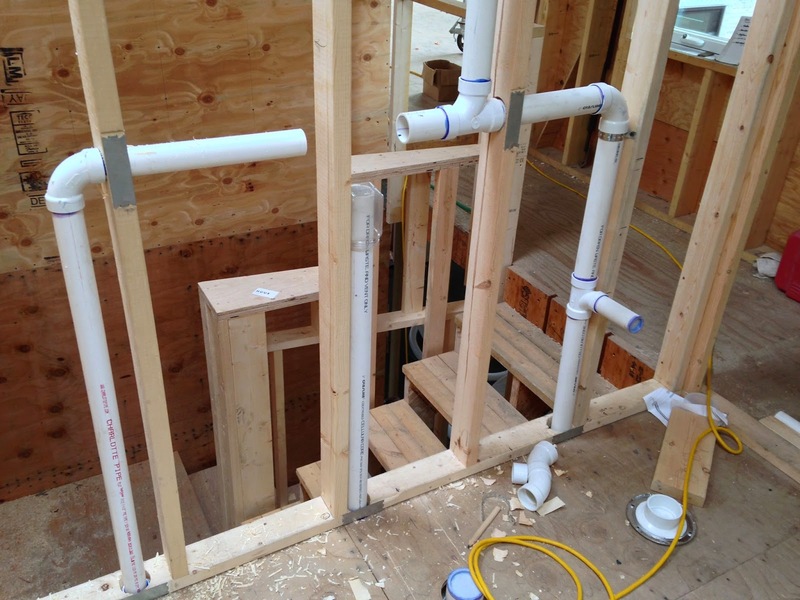 Back in May, the plumber came and installed our rough-in plumbing...cutting lots of holes in Neil's framing. We have since passed our plumbing inspection. While the plumber was working, Neil installed our fancy Swiss ventilation system. 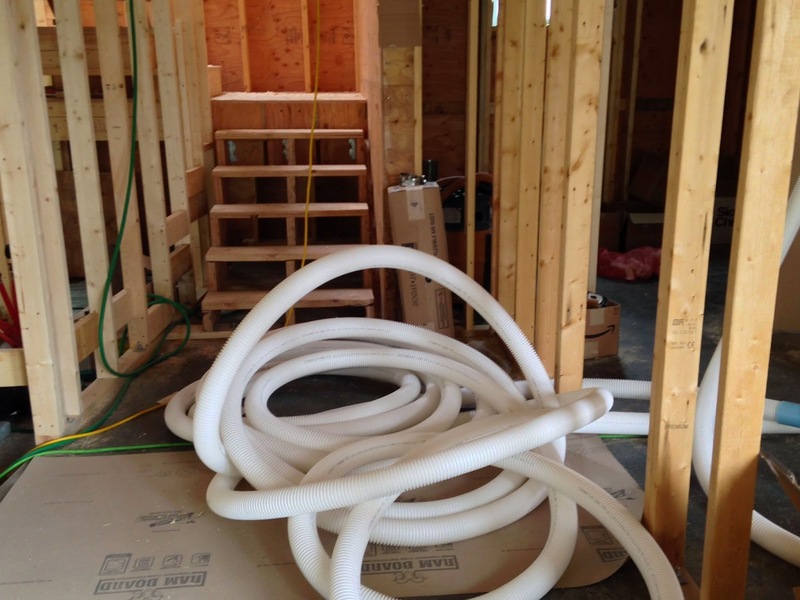 (with a little of my help running the ducting) Because we are building a tighter house with more insulation than code requires, our heating loads are predicted to be low. It is also important that we bring in continuous fresh air. Instead of losing the heat in the air we exhaust, we installed a Heat Recovery Ventilator (HRV) and specifically a Zehnder ComfoAir 200. 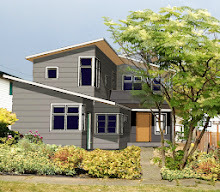 This is the most efficient residential unit available to us. It was also recommended by the energy consultants, Imagine Energy, that we worked with a year ago. They did an energy analysis on the building and then made specific recommendations for our heating, water heating and ventilation. I will do a more in-depth blog post on this at a later time. Instead of having individual exhaust fans in the bathrooms and laundry, we have exhaust registers that are connected to the HRV. We then have supply registers in the bedrooms and living spaces. Before we inhabit the house, we will have the Zehnder rep come to the house to balance the system. There were a few reasons we ended up installing the system ourselves. 1. 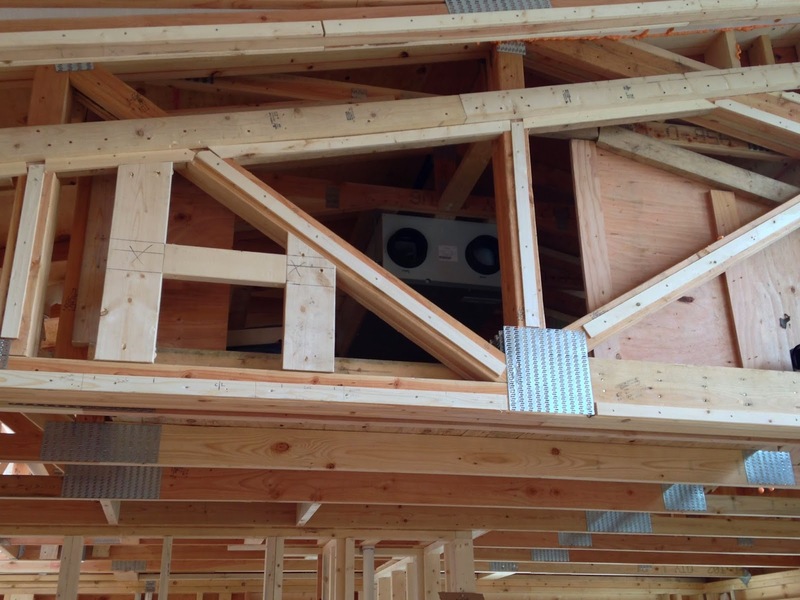 We had a hard time finding a mechanical subcontractor that had heard of it. Most tried to sell us on multiple spot Panasonic HRVs, which would have meant more holes in our building envelope, plus they are not nearly as efficient. But we did end up installing one of them in the apartment portion of the house since we want a completely separate system there and it's a smaller space. 2. The subs that did quote us on installing the Zehnder wanted a ridiculous amount for it. 3. We both watched an install video and realized we could do it. 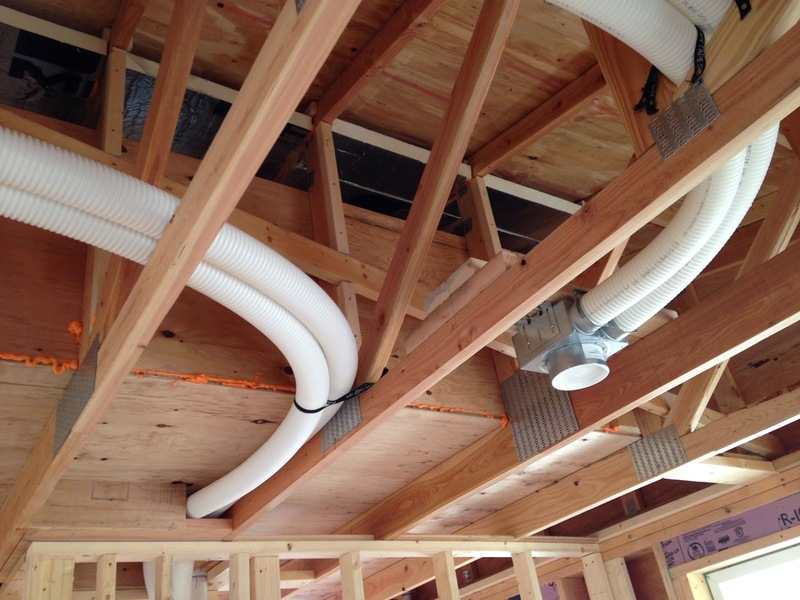 Especially since we were going to use the special Zehnder ducting shown above. Our system was designed by Zehnder America and they were very helpful in answering our many questions. 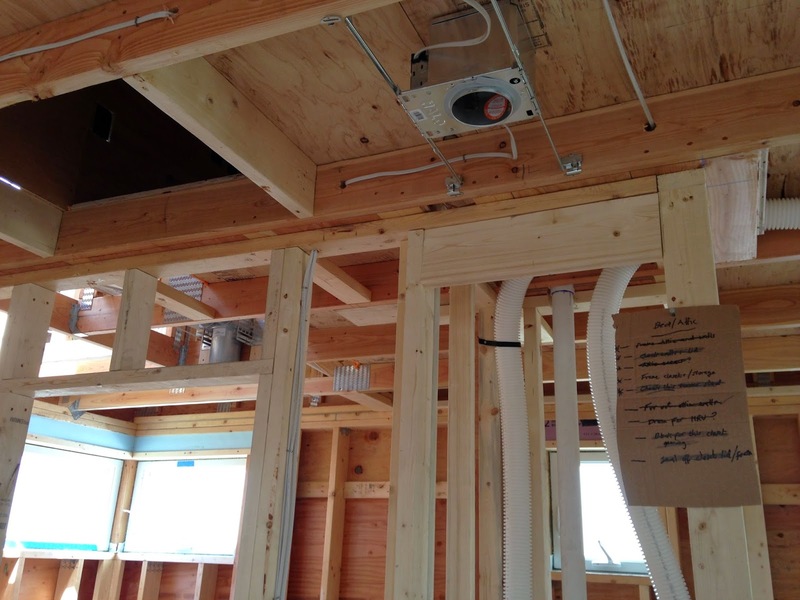 Originally we were going to install the unit in the garage, but decided to keep it in conditioned space and put it in our conditioned attic above our bedroom and bathroom. If you look closely you can see a grey box with 2 holes which will be connected to dampers that have the supply and exhausts ducts connected to it.